Thierry Mugler Alien. I have always seen this at Macy's in the perfume section right up front. And I would always test it out and absolutely loved it. But because im so cheap and indecisive I never bought it. But when I was brousing this site and came across it I had to get it. It is significantly cheaper on here than at the store. Its just as good as i remember and I've gotten soo many compliments about it. 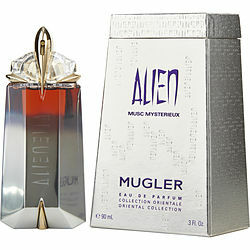 I just recently tried Alien Musc Mysterieux, this scent is original and beautiful. I will use it as a back up to Angel, of which I love. I enjoy this new scent and received compliments the first time I wore it.